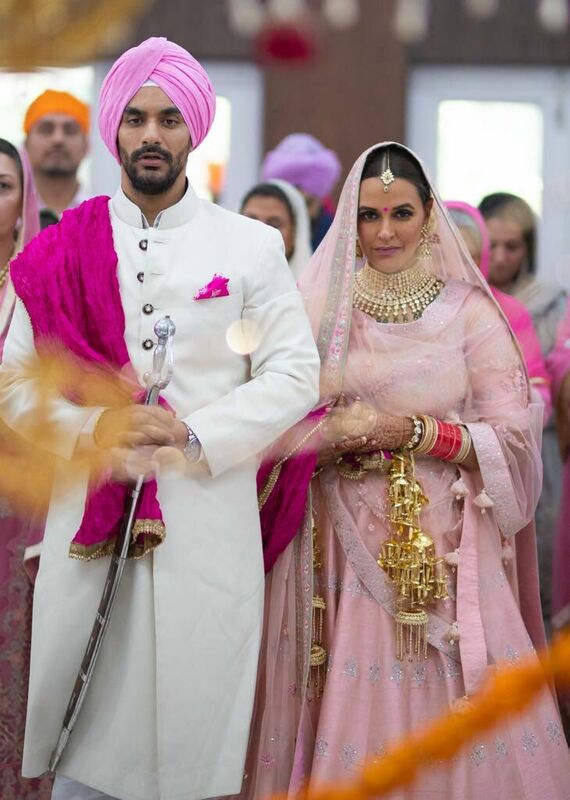 After Sonam Kapoor got hitched on May 8, 2018, to businessman Anand Ahuja, now actress and former Miss India Neha Dhupia has tied the knot with actor Angad Bedi in an intimate ceremony attended by only family and a few friends. While everyone was still hungover Sonam’s wedding, Neha went ahead and married her best friend Angad. They broke the news on their social media accounts by sharing adorable pictures from the wedding ceremony. They might not have confirmed their relationship before but their pictures were proof that it was true love and not merely friendship. Taking a cue from Virat Kohli and Anushka Sharma’s marriage the couple did not give away any hints for their impending marriage and took everyone by surprise. Dressed in a light pink lehenga and jadau jewelry Neha broke the news on social media and referred to getting married to Angad as the “best decision of my life.” Angad looked dashing in a white sherwani and pink turban. The two were in a relationship for quite some time but never made the relationship public. Angad is the son of former India cricketer Bishen Singh Bedi and the newlywed couple got married in an Anand Karaj ceremony at Gurudwara Sahib in Vasant Vihar, Delhi. The wedding was attended by Ajay Jadeja, Ashish Nehra and Gaurav Kapoor. Neha and Angad always posed for the camera and showered praises on each other for their works but they always seemed good friends and nothing more. However, now looking back we may have missed some crucial hints in their banter. Here are some of their adorable photographs before they got hitched which might have given some ideas about their relationship. On the work front, Neha has a no-holds barred talk show called BFFs with Vogue. She is also a part of MTV Roadies as a gang leader. She was last seen in Vidya Balan starrer Tumhari Sulu in a supporting role which brought her acclaim and awards too. Angad isn’t too far behind, making his place in Salman Khan’s camp with a role in Tiger Zinda Hai. He was also seen in a negative role in Amitabh Bachchan and Tapsee Pannu starrer Pink. Angad was a cricketer till the age of 16 and has played in the Ranji trophy matches as well. He is best friends with cricketer Yuvraj Singh. He also worked opposite Alia Bhatt in Dear Zindagi.